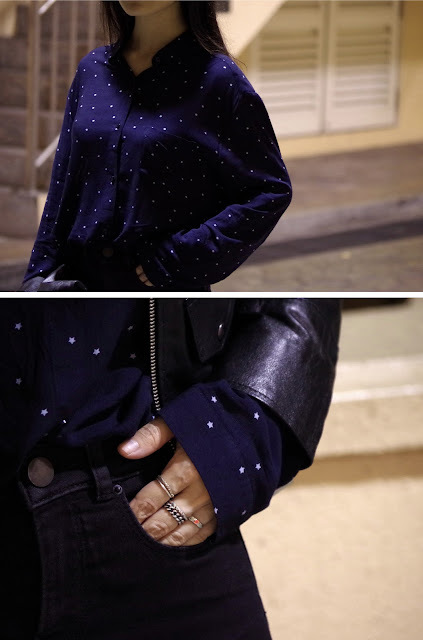 The number of star printed shirts in my wardrobe has been grown exponentially over the past year because of the sudden popularity of star printed items in the fashion industry. What a delight for star lovers like myself, though not so good on the wallet - but I'm glad a now have a stash of amazing star printed items to last me through the years when star prints are not that 'in'. Just like how many consider polkadots to be a classic print, stars are the same to me. I'm not a fan of repeated rounded stuffs hence not a single polka dotted print item in my wardrobe! Oh and, I obviously did not walk around SG with 2 long sleeved apparels on - that's just insane. LJ only for the photos because I would def wear the entire outfit if it were 10 degrees cooler!